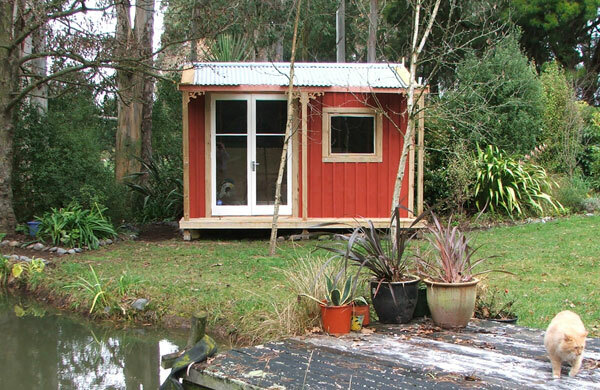 I've always wanted a garden shed - or, to be more accurate, a garden shed-with-a-bed. After much guilt-tripping (Can I afford it? Do I need it?) I now have one such. I can just wander out through a gate over to the pond, and there it is. But it's called Pond Cottage. 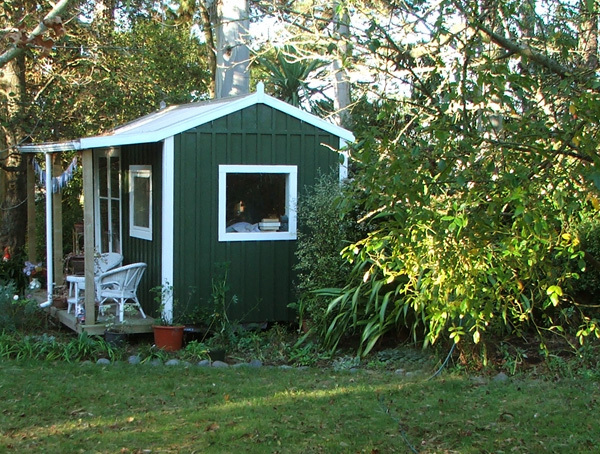 Initially (when in negotiations with Non-Gardening Partner) it was very definitely a shed. 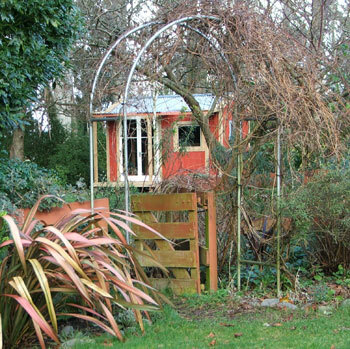 That made it sound less frivolous and more functional - the sort of outbuilding that a real gardener deserved. It came in a kitset, already painted powder blue. Non-gardening Partner and I did the foundations and floor, and our builder put the 'shed' up. All terribly sensible, and I managed to skilfully side-step NPG's persistent question - why did I need a shed anyway? I was quite happy to keep on calling it a 'shed', but then my hiking friend visited especially to have a peep. She was adamant - my little building was far too beautiful, and the word 'shed' just didn't do it justice. How about 'The Shed'? I suggested, miming the upper case letters. No. This made it sound like a trendy gourmet country restaurant - where customers sat rough and paid far too much for their food. Thinking rationally, the 'shed' is my 'bach', a home not-so-far-away from home, a place to which I can retreat with a book and sit out under the stars - and do nothing. My friend, being an English gentlewoman, suggested the word 'cottage'. Hmm... This was more promising. Rose Cottage? Not really a very rosy spot - the surrounding gardens are leafy and spiky underneath tall Australian gum trees. Phormium Cottage? Accurate but not romantic enough. Cabbage Tree Cottage? 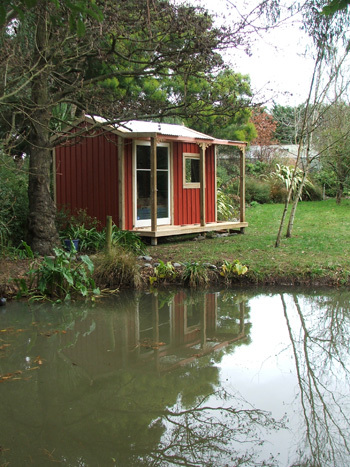 This has the required New Zealand flavour, but unfortunately the cabbage tree behind the shed is modest in size. My lovely friend always supports me when I have silly ideas (that's what true friends do, after all). And she's right - my shed now has the perfect name. Welcome to Pond Cottage. NGP and I are fast finishing everything - the verandah decking, lining and insulating the inside, painting the walls, and so on... You're welcome to pop by anytime! Update - Pond Cottage has turned green! In the late autumn of 2012 I bought a huge tin of green exterior paint for seven dollars from the recycling store. It was just too tempting.